يشكل Breakfree Peninsula Apartments بموقعه الممتاز في المدينة نقطة انطلاق جيدة لاستكشاف أفضل ما فيها من معالم ومناطق نابضة بالحياة. إن موقعه الجيد الذي يبعد فقط عن مركز المدينة يساعد النزلاء على الاستمتاع بمعالم المدينة ونشاطاتها. كما يمكن الوصول بسهولة إلى عدة معالم سياحية قريبة. إن الخدمات التي يقدمها Breakfree Peninsula Apartments تضمن للنزلاء إقامة مريحة. هذه بعض الخدمات الموجودة في هذا الفندق: خدمة الغرف على مدار الساعة, متجر, مكتب الاستقبال على مدار الساعة, مرافق مخصصة لذوي الاحتياجات الخاصة, تخزين الأمتعة. في الفندق غرف نوم يتجاوز عددها 93، كلها مجهزة بعناية وجمال وبعضها مزود بـ غرف لغير المدخنين, مكيف هواء, شرفة/ تراس, تليفون, مروحة. إن حوض استحمام ساخن, مركز للياقة البدنية, ساونا, مسار جولف - ضمن 3 كم, حمام سباحة خارجي هو المكان الأمثل في الفندق للاسترخاء وتفريغ طاقتك بعد نهار طويل. اكتشف مزيجاً ساحراً من الخدمة الاحترافية والخيارات الواسعة من وسائل الراحة والمتعة في Breakfree Peninsula Apartments. يفرض هذا العقار سياسة صارمة على إحداث الضوضاء. لا يُسمح بتواجد الزوار في المنطقة السكنية بعد الساعة 10:00 مساءً. My family really enjoyed our stay! The room is big and spacious with great magnificent ocean view. 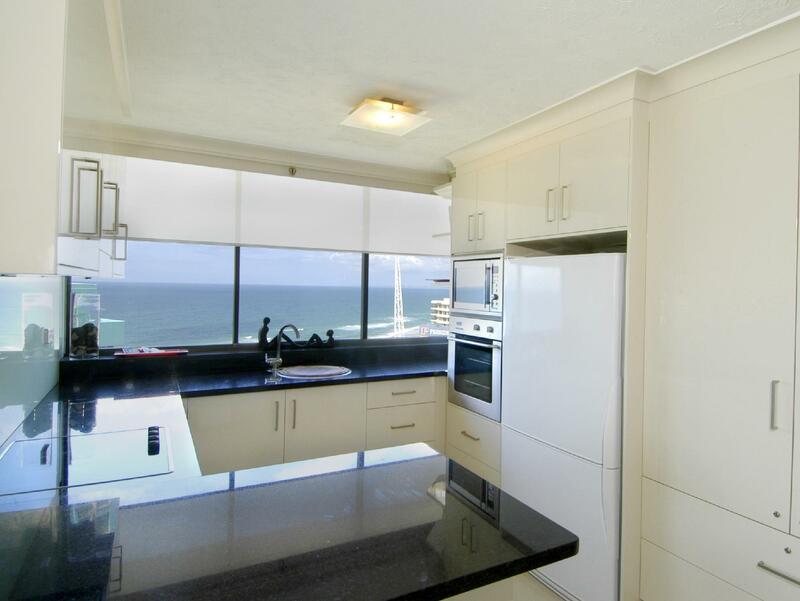 Within walking distant to central of surfers paradise where restaurants are located. Cross the road and you reach the beautiful sandy beach and Pacific Ocean! You need to experience it yourself to believe it! The room was very dated and in need of some tlc. No airconditioning heating and was cold. Only Heater available was from reception was a small blow heater. Tiles missing on balcony. End of kitchen bench missing pieces. Good location and this hotel does have 3 swimming pools ( one in door and two out door) and 2 spa's but other then that its not good at all. Older building that is in bad need of a renovation. The floor i was staying on ( level 9 ) smelt very bad when you got out of the lift. I was far to embarrassed to have any one come over to this terrible hotel. Poor quality bedding, mattress and sheets and terrible pillows. I would not recommend this hotel at all to any body with any class but it would be OK for family's on a tight budget or bogans that don't know any better would possibly think its nice. Well its not nice at all. Look else where as there are far better options to stay near by for similar money. 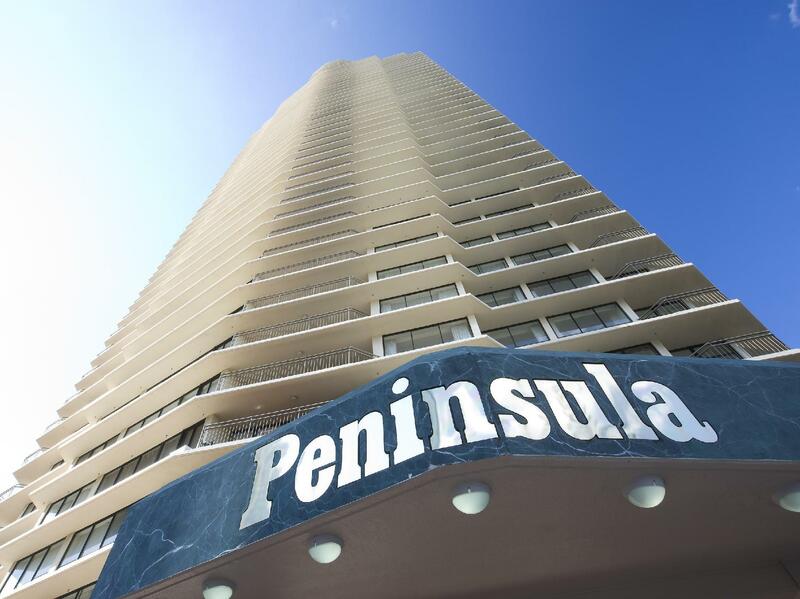 Peninsula Apartments are excellent! We (2 adults and 2 kids - 15yrs and 12yrs) stayed on the 18th Floor - Apartment 18A (2 bed and 2 bath) Delux Apartment for 6 nights. The apartment was gorgeous with breathtaking 270• ocean views. We had ocean views from the balcony, lounge, kitchen, Master bedroom and the 2nd bedroom. THre apartment was very clean with all necessary amenities provided. Free undercover secure parking. 4 guest elevators, garbage chutes in each floor, 3 pools and Main entertainment shopping area of surfers paradise just a 4 minute casual stroll away. The much hyped New Years fireworks display can be clearly seen from the balcony. Cons: The 2nd bedroom Had translucent roller blinds which meant that bright morning sunlight would wake the kids up at 4.30am. The balcony glass balustrade and apartment ceiling to floor glasses overlooking the ocean could have been cleaner to provide clear views to the ocean. Our stay were wonderful. We booked three units during Christmas holiday. Quite peaceful location, away from the hustle and bustle of the main road of Surfers Paradise, yet Cavill Avenue is within walking distance. Spacious self-contained unit. Sometimes we cooked, most of the times we explored Surfers Paradise's various cafes and restaurants. The hotel did not provide breakfast, but they did provide a list of restaurant offering deliveries to the hotel. Very comfortable room. Feels very homely. I wish we could stay longer. It was a good stay at the Breakfree, very close to Surfer's Paradise and Broad Beach. And it's just next to the Sky Point Towel, right opposite the street. This apartment actually provides a good view of the beach, however it depends which floors u were being assigned. We were assigned to level 12, the view was still good but it we can get level 30 and above it should be superb (so do try to request). The good thing bout this apartment is they provide basement parking. However the rooms are a bit old and run down, an upgrade should give them a value add on status since they are located at a very good area. And do take note on the public parking along the Broad Beach street on Sunday, they have a night market on Sunday evening so the parking turns invalid on the noon. We stayed for a 2 day visit and did not have to pay extra for the car park. The size of the 2 bedroom apartment was great and the view of the beach was amazing. The apartment was large but looked a bit dated. We booked here because there was a tennis court and because it is so close to Cavile Ave. Unfortunately there were renovations being done and the court was not available for most of the day. The pool hasnt got that resort feel that other places have. The place is a bit tired but is well maintained. The position is very good. 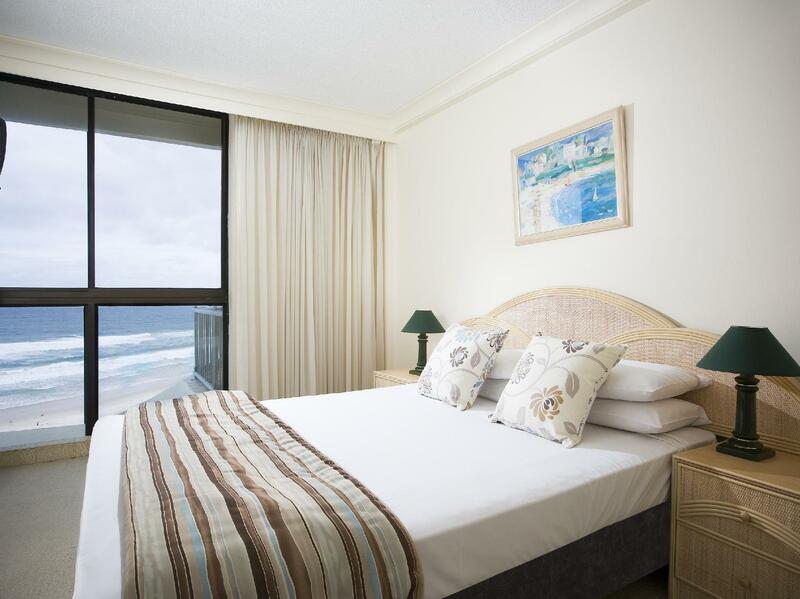 Conveniently located near the heart of Surfers Paradise and yet having its peace and quiet. Awesome view of the beach and sunrise. This is the second time we are staying at this apartment. During our recent stay, we were given the 17th floor. The view was breathtaking. We could see the entire stretch of surfers paradise. It was amazing to sit at the balcony, enjoy the sunrise and cool breeze and watch the early ones fish, jog and walk on the beach. We'll definitely go back again! It was highly recommended by a frind who lives in Gold Coast and it's whoth every penny of the price. The location is great with little restuarants surround the apartment. Large floor-to-ceiling windows provide beautiful ocean views. Also,the staff were so nice and friendly. Upon arrival, we were allowed for an early check in. Paid for a 1 bedroom apartment but got a 2 bedroom apartment. Apartment was huge and has all neccessities convieniently provided in room like oven, microwave, dishwasher, laundry washer n dryer. Cavill mall is just a walk down the street and the beach is just across the street. Bus stops are also nearby. Need to walk abit though. View from the balcony is stunning. However, do take note that you are required to pay a A$200 deposit upon check in. That came to me unprepared and as my card has not enough credit, I made the payment by cash. I did an early check out and the reception was not yet open. (reception open from 8am to 6pm) as such, we did not receive our deposit refund. Was told that its going to be transfered to my account. Still waiting for the transfer though. Was told that it will take abt 3 to 4 working days. There was no room service and we had to clear all the rubbish and clear the dishes upon check out. Or else credits will be deducted from the deposit amount. Apart from those, it was pleasant stay. Peace, Tranquillity, Ambience, friendliness and Relaxation. The title says it all......These are just a few of many positive words to describe this resort. I have stayed at the Peninsula Resort for many years now and I have not been let down once. The Peninsula Resort provides a great environment for both families and groups alike. close to the center of surfers, location and pool heated. we were down for a poker touament, booking on line was very easy, check in was very easy and staff was very good, very close to caville ave,for food and entertanment,was very sattisfied with the location and the appartment. would recomend to any of my friends. thanks. The hotel is a little aged, furniture reflects a 90s feeling. But, the stay was good. I stayed in a 2 bed room apartment with a well equipped kitchen, washing machine and dryer, big dinning table and cable tv (if that's important to you). You will need to pay for the internet. Parking was easy as there was free basement parking. Location is very good, the beach is just infront of you. Overall, a good experience. my little short review i booked a single bedroom apartment, for some reason, i guess they are out of rooms, so they arrange me to stay in a high level 2 bedroom apartment. it was a very big, clean and brightly lited room, with a 170 degrees of both sea and city view.... it was breathtaking. the stuff are very helpful and patient, as my command of english is limited. have a wonderful stay there. I was so happy with the suite, the staff, the added extras (Spa, sauna, heated pools etc.) and the close proximity to the beach & all amenities that I will definitely be back and will recommend these Apartments to all my friends!!! the apartment for the 4 of us incl 2 teengares was perfect. requested for a sea facing unit and was kindly given one at 30 floor, beautiful view. adi the caretaker was excellent, helpful and nice. only issue was given that we stayed for 6 nites, they didnt give enough coffee and tea packets to last for that number of days stay. otherwise they had packets of liquid soap for dish washing, washing machine.